Above: The Beatles Story is a permanent exhibition located in the revitalized waterfront along the River Mersey. The Beatles Story features a series of exhibits chronicling the Beatles career. 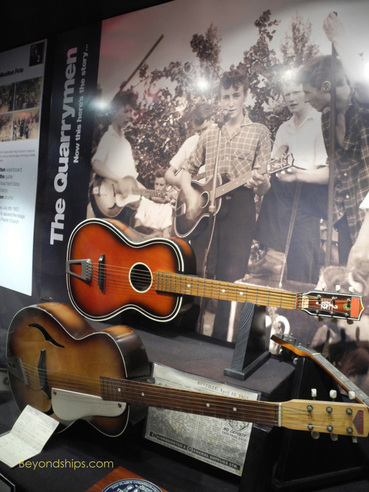 Above: An exhibit about John Lennon's early band The Quarrymen including examples of the types of guitars Lennon used at that time. Below: A depiction of an early Beatles recording session. Above: John Lennon's boyhood homes Mendips. Below: The window of Lennon's bedroom. Above: Paul McCartney's home at 20 Forthlin Drive. Liverpool's four most famous sons are without question, The Beatles - - John Lennon, Paul McCartney, George Harrison and Ringo Starr. Their music, much of which was created nearly a half century ago, speaks to millions. Thus, a port call in Liverpool demands a pilgrimage to the places where The Beatles got their start. This is so not just for their fans but also for people who are interested in modern history because The Beatles’ influence went beyond popular music to impact social mores and attitudes. 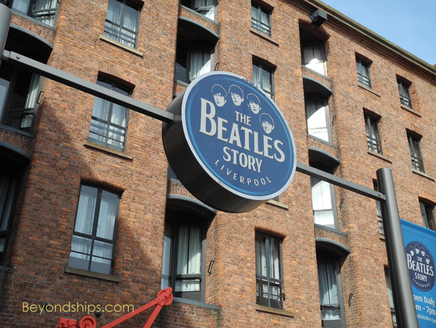 The tour that I went on began with The Beatles Story - - a series of exhibits housed in a revitalized warehouss along the river Mersey. The majority of the exhibits consist of giant photographs and panels with written material. There are also examples of musical instruments, electronic equipment and artifacts that are similar to the ones actually used by the Beatles. In addition, there are some high tech exhibits using three-D animation, a children's discovery centre, a Starbucks and a store wich sells everything Beatles. Included in the entrance price is an audio device which you can listen to at designated points in the exhibition. A mountain of information is presented in an easily digested manner. It is particularly good for people who may only know the broad outlines of the Beatles' history. While the experience would be enhanced if there were more actual artifacts from the band, such items would undoubtedly be difficult and expensive to come by. Furthermore, I doubt that, at least in the early days, even the Beatles realized the need to preserve their possessions because of their historical value. 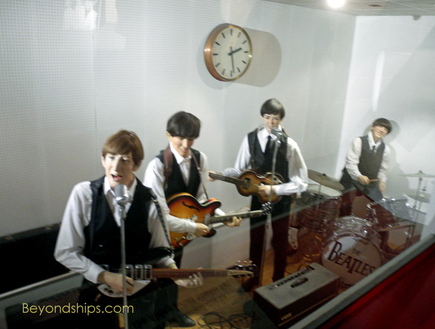 Although The Beatles Story is located in Liverpool, the exhibits extend beyond the group's Liverpool days, beyond the break-up of the band and into their subsequent careers. There is also an exhibit about Elvis Presley, who influenced The Beatles when they were growing up. One of the most striking things I noticed at The Beatles Story was not in the exhibits but rather was about the people who came to see the exhibits. The Beatles were the sound of the 1960s and in many ways shaped that time. But the majority of the people visiting the exhibition were born after that period, well after the group split up. This really brought home the fact that The Beatles' music and their personalities have transcended their time. Furthermore, the international composition of the visitors underscored that they have also transcended their roots in the English-speaking world. After spending time at the Beatles Story, we drove through the city and out to the suburbs. The scenery shifted from an urban landscape to broad tree-lined streets occasionally interrupted by commercial areas. 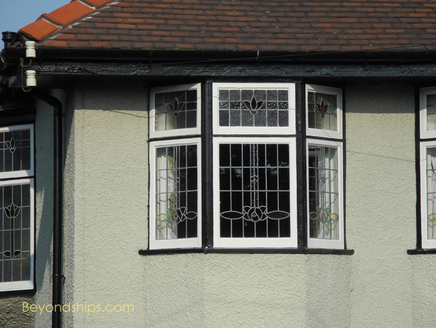 Our first destination was Mendips, John Lennon's boyhood home in Woolton. Lennon came here at the age of five. His mother and father had separated and he was sent to live with his Aunt Mimi and Uncle George. He lived there until he was 23. 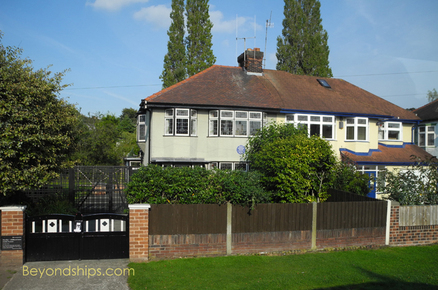 Mendips is a semi-detached house built in 1933. It is a neat, comfortable middle-class house typical of that period. Architecturally, there is nothing outstanding about the building. Rather, it is of interest because of who lived there. 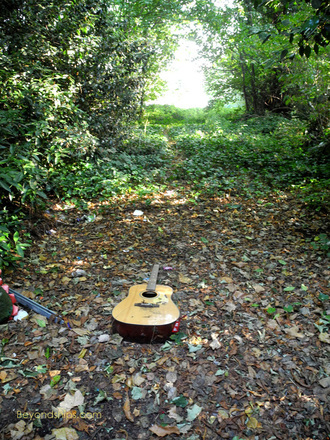 While he was living there, Lennon developed his musical talents. Despite his aunt's warnings that he would never make a living playing the guitar, he devoted much of his time to playing that instrument and rehearsing with the various bands that he formed. Several of The Beatles' early hits were written at Mendips. Indeed, their first number one hit, "Please Please Me" was written in Aunt Mimi's bedroom. In view of the importance of Mendips in her husband's life, Yoko Ono, purchased Mendips and donated it to the National Trust for Historic Preservation. It has now been restored to the way it would have looked in the 1950s and early 1960s when Lennon was living there. This includes period furniture as well as some original furniture. This is not a grand stately home and it would be overwhelmed if the large numbers of people who come by were allowed to tour the interior. Therefore, the National Trust limits access to the interior to those on its own mini-bus tour. (See separate article). Not too far a drive is 20 Forthlin Drive, the seventh and final house where Paul McCartney lived while in Liverpool. It is not as nice a house as Mendips but it is still comfortable. 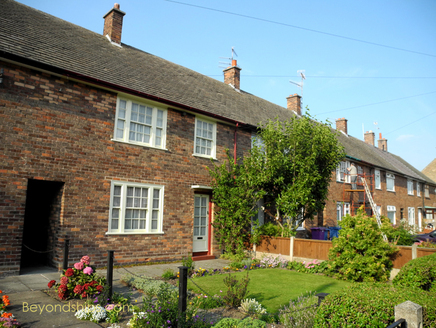 Built in 1952, it is a typical example of post-war terraced council housing. There is a small garden in front of each of the attached houses along the street. The McCartneys moved to Forthlin Drive in 1955. For most of the nine years that he resided there, Paul lived with his father and brother, his mother having passed away in 1956. The National Trust, which has restored the interior, says: "The McCartney men weren't as houseproud as Aunt Mimi so expect to see mismatched wallpaper, clutter and threadbare sofas." There are also black and white family photos taken by Michael McCartney, Paul’s brother. As with Mendips, the interior is only open to those on the Trust's tour. ((See separate article). Visitors to the two homes have included celebrities as well as the general public. According to newspaper reports, Bob Dylan boarded a tour bus unrecognized and visited the two homes. Along the same lines, our guide told us that a local entrepreneur approached a man he saw in the neighborhood and offered to show him where Paul McCartney grew up in exchange for 10 pounds. The entrepreneur's Beatles expertise was apparently not very extensive as the person he approached was Sir Paul who happened to be visiting his old hometown.